The original size of the castle was four times larger than what we see today. By the 18th century, it had been abandoned and sacked and its stones scavenged by builders of new homes. In the early part of the 20th century, all that remained was the present building with a sunken roof. After World War I, Prince Obolenski, a member of Russia’s Romanov family, sought temporary refuge here. (The name Codignat is derived from de Codonhac—one of the noble families who once lived here. In 1971, the ivy-covered property began a new life as a stunning hotel. The Château de Codignat has been a member of the Relais & Châteaux association for over 30 years, so you can be assured the comfort level and the quality of the cuisine is high. Room prices may seem high, but remember they are half-board, meaning breakfast and another meal of the day are included. Have a good map with you to find the château; it can be a little tricky. Rates include service, but not breakfast. From Clermont-Ferrand, drive east towards Thiers on N-89. When you reach Lezoux, continue on D-223 towards Courpière. Turn again on D-309 and follow the signpost to Bort l’Etang. If you go into the village of Bort l’Etang, you’ve gone too far. The nearest train station is in Lezoux, 4 km away from the castle. Nearby: fishing; horseback riding; helicopter excursions over the volcanoes of Auvergne. 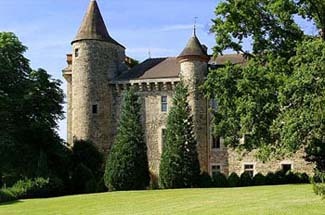 Stone turrets peering above the treetops direct you to this medieval castle hidden deep in the heart of France. Elegant throughout, Renaissance tapestries hang on rough-hewn stone walls, heraldic arms emblazon open fireplaces, and fine antique furniture fills the public lounges. Individually decorated guest rooms feature Louis XIII furniture, while private whirlpools highlight the bathrooms. Opt for an apartment, or suite, in one of the stone towers and enjoy a fine trompe l’oeil wall painting. Another of the towers holds the dining room, where meals, using fresh produce from the château’s own gardens, are served by candlelight.